MANILA, April 27 (PNA) -- Malacañang on Thursday said the case of Mary Jane Veloso will be at the discussion table when President Rodrigo Duterte hosts his Indonesian counterpart President Joko Widodo for a bilateral meeting Friday. This was disclosed by Presidential Spokesperson Ernesto Abella in a statement sent to reporters. Widodo will arrive for a state visit on April 28 following a state visit by Sultan Hassanal Bolkiah of Brunei on April 27. Abella said state visits of the two leaders are excellent opportunities for the Philippines to further strengthen bilateral relations with its ASEAN neighbors. Besides issues of common concern, the Palace official said the condition of Filipino workers will also be discussed. 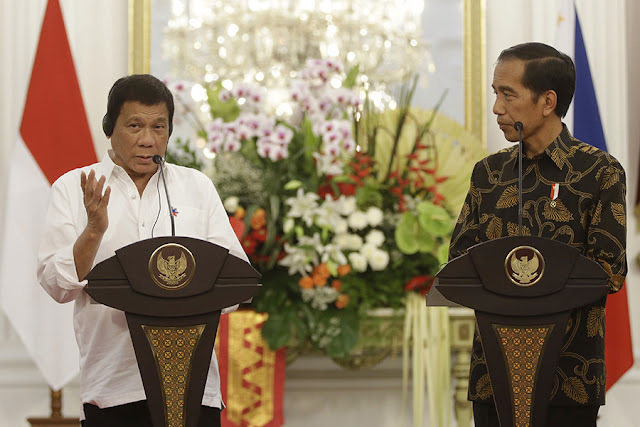 “President Duterte will separately discuss with Sultan Bolkiah and President Widodo issues of common concern, such as security of our sea lanes, cross-border traffic and patrol, and economic cooperation,” he said. “The President can also be expected to discuss the situation of Filipino workers in these countries, including the case of Mary Jane Veloso,” Abella said. Veloso was arrested in April 2010 at Yogyakarta airport in Indonesia after 2.6 kilograms of heroin was discovered in her luggage and was sentenced to die on October of the same year. She was granted a last-minute reprieve from execution in April last year after the surrender of her recruiters in the Philippines. Last Wednesday, Veloso’s mother, Celia, went to Malacañang to request President Duterte to ask for clemency for her daughter.